Checking and Savings. CDs and IRAs. Mortgage and Personal Loans. And So Much More. 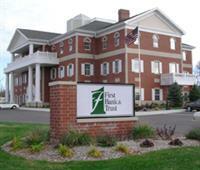 At First Bank & Trust, we believe personal banking is just that. Personal. So whether you take advantage of all our personal banking services or only a few, we work hard to make you feel right at home. After all, banking should help make your life easier. That's our goal every day. Located at the corner of 6th Street and 5th Avenue near downtown Brookings, SD.